In this video we continue our overview of the HO scale model we constructed of the Ohio Creek Extension on C&S Railway, and head north into the mountains to visit Ruby Junction. The branch line of Ruby Junction spiders off and services a few different portions of Elk Mountain Railway, including Ruby, East Ruby and Irwin. With high country regions such as Ruby Junction, the railway terrain shifts and becomes distinctly mountainous, presenting a new challenge for model railroaders. We saw this as the perfect opportunity to show off some of the model railroad mountain scenery our builders utilized to flesh out this portion of the Ohio Creek Extension. 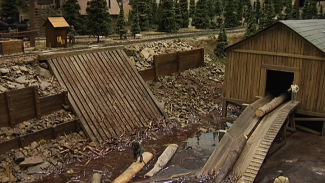 So with that in mind, let’s take a closer look at the model railroad mountain scenery we used in our layout to bring small-scale Ruby Junction to full-sized life. When building out a mountain scene like Ruby Junction, a number of unique challenges arise for making the design appear as realistic as possible. 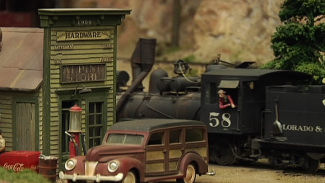 To create the convincing model railroad mountain scenery you’ll discover in Ruby Junction, our team utilized a combination of scratch-built objects and commercially available products. For the landscape, we included a range of trees, plants and undergrowth that can be purchased at any craft store. 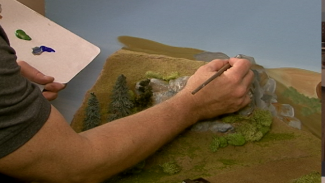 Weathered using foam and paints, the model railroad mountain scenery was made to look wholly natural and was modeled after real-life scenes we discovered when researching the Elk Mountain Railway as it existed in decades past. Similarly, we built from scratch other features of our model railroad mountain scenery, including the steel viaduct under which Engine 58 West passes to reach its next stop in Ruby. This narrow bridge was designed after the Georgetown Loop High Bridge, which was constructed in the 1940s to transport ore pulled from the mines of the Rocky Mountain chain. With this and other lifelike features, Ruby Junction and other aspects make this model railroad mountain scenery truly a sight to behold!